8Coupons is crowdsourcing the best eating deals in the city. So you're not made of money these days, but you still want to eat out pretty much every night, because if you didn't, you'd live in rural Kansas. We get that. More importantly, 8Coupons gets it. 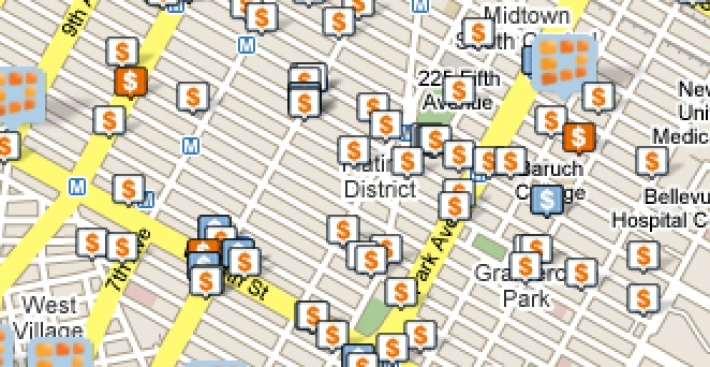 Over on Grub Street they tested out the site's new "NYC Money Map," and we followed suit. 8Coupons maps deals (or all kinds -- it's not limited to restaurants) via Google so you can plug in your zip code and see where to save near you. We found a couple of cool items -- like a $30 four-plus course chef tasting menu at the East Village's excellent Chiyono, or Tabla's $25 three-course lunch -- but the site still has to work out plenty of kinks. Since many of the deals are user-submitted, it's up to you to double-check the deals -- we spied quite a few for places that, sadly, are closed (like Park Slope's beloved Lighthouse Tavern, R.I.P.). On the plus side, if you're worried about your neighborhood local surviving the recession, put it on the map so others can find it.